I have been very honoured to serve as your President over the last year. Denis Unsworth was a hard act to follow. Many have helped me especially Beverley Sillitoe, the Association Office Manager, assisted by Layla Heaton and by David Mercer, editor of the Newsletter. The Stonyhurst Association Annual Dinner was held at the magnificent Hurlingham Club in London on 14th September with James Hanratty OS 54 – 64, presiding and Baron Hennessy of Lympsfield, guest speaker. The idea behind The Family Weekend is to give parents and children an enjoyable experience of Stonyhurst in the twenty-first century with the hope that OS and Catholic families will think seriously about the values of a Stonyhurst education. A near record attendance of 246, including 5 tables of young OS and their guests, enjoyed an evening of reminiscences and fun in the ‘Spirit of Rugby Suite’ underneath the west stand at Twickenham Stadium for the annual Association dinner on Saturday 3 November. Ingram Cheung OS and Maddie Callinicos OS with their charges at SCHT, 2008. 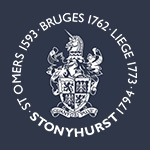 The Stonyhurst Children’s Holiday Trust is one of a number of charities which various OS are involved with: see page 21. The front cover shows one of the last photographs taken of Tim Hetherington OS 81 – 89, RIP who was killed in Libya last April as a photojournalist whilst reporting the rebellion against Ghadaffi in the town of Misurata. Olest, niminis duntur, ide nulla veriore rsperia ectassum aut atem facerspe alic tem inimi, am, tent ius. Im idunt quunto deniae sum re, ipiendunt vellita susam facea num, officia spellat.